I love earrings. They’re my favourite kind of jewellery to wear, they’re easy to make — even if you’re making something else you can almost always get a pair of earrings out of the leftovers — and being small and relatively inexpensive they’re easy to buy too. 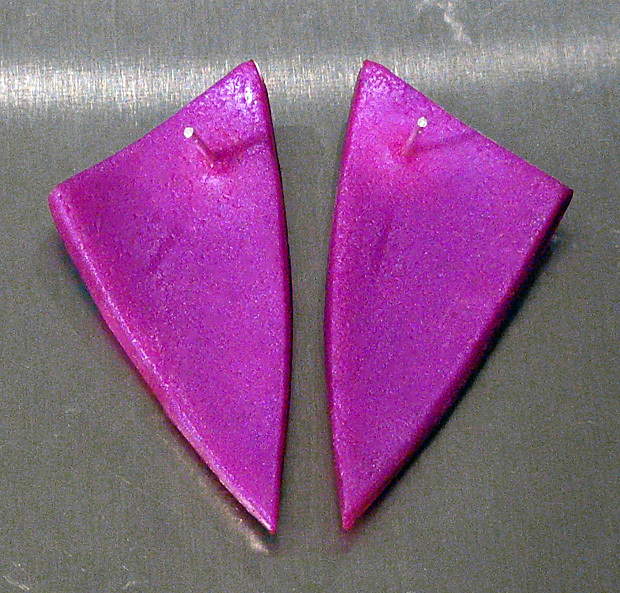 When using glue-on findings to make stud-type polymer clay earrings, I’d suggest you don’t just glue the studs on. Add a thin backing of polymer clay too, which looks tidier and more professional and holds the studs more strongly as well. Here’s a collection of tips along with step-by-step details of what I do. Hopefully some of the information will be of use to you! Piece of scrap paper or cardboard. Glue-on earring studs are available in a variety of metals and pad sizes. 6mm pads are a good overall size, although I use smaller pads when space is restricted, and larger pads when I want to be extra-secure and placement of the pin relative to the earring face allows it. I find superglue gel easier to control than superglue liquid, and I like the Loctite brand because it’s less runny than some of the other gels I’ve tried; I also find the squeeze bottle easier to handle than a tube. I get it from my local Bunnings (a hardware superstore if you’re not in Australia), but any type of superglue (cyanoacrylate glue) will work. There are a few further notes on glues at the end of this post. Tweezers (optional but highly recommended!). Use tweezers to hold the earring studs when you’re applying glue to the glue pads, positioning them on your earrings, and pressing them into place. This is MUCH easier than holding them in your fingers, and your fingers will be safe from the glue as well! 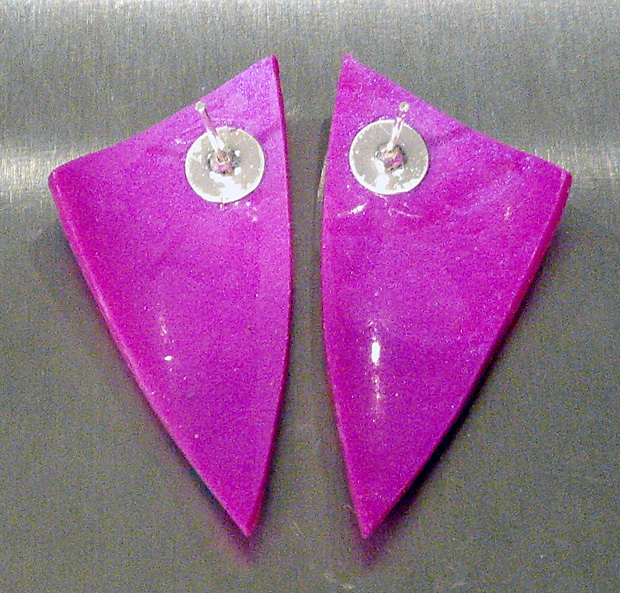 Cut, shape and cure the “fronts” for your earrings. You don’t have to cure them first but I find it easiest to do so. Work out where you want to attach the earring studs, and what size (glue pad diameter) you need. Ideally there should be some polymer clay visible all around the glue pad so that the backing sheet can attach strongly everywhere. As mentioned above, I find 6mm glue pads a good size for most earrings. If I’m not sure where I want to position the earring studs on a new earring shape, I use scrap clay to make some “dummy” earrings of the same shape and size. I can then experiment with different stud positions to see how the earrings sit when worn, before attaching earring studs to my “good” earrings. Squeeze a small amount of superglue gel onto a piece of cardboard or several layers of scrap paper. Use a toothpick to pick up a small amount of the glue and apply it to an earring stud’s glue pad. Cover it with a thin layer, but don’t use too much. Position the earring stud where you want it on your earring, and press firmly for about 10 seconds to ensure a good bond is formed. The superglue will hold almost instantly so be careful about positioning. If necessary you can pull incorrectly positioned studs off before the glue is fully set and have another go; this is another good reason to cover the backs of your earrings because you’ll be able to see where the glue was. Give the superglue a bit of time to set strongly before proceeding with the next step. 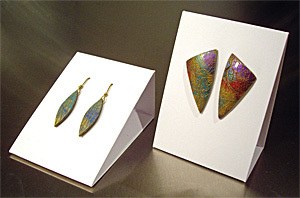 Roll out a thin sheet of polymer clay in a colour that complements the earrings. I usually use a clay sheet of 2-3 stacked playing cards thickness, depending on how thick or thin my earring fronts are. Smear a very thin layer of liquid polymer clay all over the backs of your earrings to help the uncured clay backing bond firmly to the cured clay. Don’t apply too much liquid polymer clay or your backing sheet will slip around when you try to cut it. Take a piece of the uncured clay sheet roughly the same shape as your earring but somewhat larger, poke the pin of the earring stud through it, then press the clay onto the back of the earring. Be careful not to tear the clay around the pin. If it does pull a bit, gently coax the clay back into place with the end of a toothpick. You can also make a hole for the pin with a piercing tool first. This can help avoid tearing the clay sheet. Press the raw clay sheet firmly against the back of the earring, then trim it to match the earring’s size. If any air is trapped between the backing clay and the earring, either coax the bubbles out past the edge of the earring by pressing gently, or cut or pierce them and press the air out. If there’s a lot of extra clay, cut most of the excess off first so that it doesn’t drag on your blade or get in your way. I like to use a small pair of scissors for this but you can use your regular clay blade or a craft knife too. I usually curve the clay sheet over the edges of the cured clay, then press gently all around the edges. This thins the clay sheet at the point where you want to cut it, making it easier to cut without shifting. Hold your blade against the side of the cured clay and use it as a guide for trimming the backing sheet. If the backing clay starts to shift hold it gently in place with your other hand while you cut. Also, try cutting towards any points instead of away from them. You can leave any trimming until after you’ve textured the backing clay. I get a better result when I do the main trimming at this point, with a final tidy-up after texturing, but try both approaches and see which works best for you. Optionally, texture the backing clay, then check the edges and trim off any excess clay. Texturing the backing clay disguises any imperfections, and can be more comfortable to wear for pieces that sit directly against the skin (completely smooth clay can stick). It’s also an opportunity to sign your work by impressing your name or logo. I mostly use a set of three Clay-Yo texturing sponges that I got from PrairieCraft (I like the finest texture for earrings). I’ve also used a thicker sponge that’s meant for creating fake beard effects in stage makeup. Other texturing ideas include coarse sandpaper, toothbrush bristles, and scrunched-up aluminium foil. Do a final check and make sure the edges are neat, both earrings in a pair are consistent in texture and finish, and the overall effect is pleasing. I run my fingertips along the edges of the pieces I’m making to ensure they’re smooth. If there are any really sharp edges or corners that would be in contact with the skin, I soften these slightly with gentle pressure to make sure the piece is comfortable to wear. I also sometimes use my fingers to gently drag a bit of the raw backing clay against the edges of the cured clay to make sure there’s a seamless blend rather than having noticeable layers. Cure the earrings using the temperature and time appropriate for the brand(s) of polymer clay you’re using. Be sure to use a high enough temperature and a long enough time for the cured backing clay to be strong. Click HERE to see my curing recommendations for common polymer clay brands. It’s completely OK to cure polymer clay multiple times. In fact, doing so is very common for certain types of construction, for instance where backing layers, edging or decorative layers are applied. If you’re worried about light colours darkening with multiple extended curings, you can leave the longest curing until last to maximise the strength of the whole piece. I’m sometimes asked about how superglue gel compares to E6000 and other adhesives for this type of task. In the testing I’ve done — gluing a bunch of earring studs onto a test piece with a variety of adhesives, leaving it long enough for all the adhesives to harden, then applying force in various directions to try to pull the earring studs off — I had much better (stronger) results with superglue gel than with others. Keep in mind, however, that most superglues lose their strength with heat, for most at around 150°C (300°F). This is not a particular issue with re-curing earrings after gluing on earring studs and applying backing clay because the backing clay not only hides the glue pads but also holds them firmly onto the earrings. If there is no such backing clay or other physical reinforcement, superglue strength loss with heat needs to be considered when re-curing glued clay or heating it significantly (e.g. with a heat gun to make a Kato Clear Medium coating turn shiny and transparent). Superglues exist that retain their strength at significantly higher temperatures, but they are difficult to find and a lot more expensive. Be aware that some superglues that claim to be highly heat-resistant in fact are not any more heat resistant than the 150°C (300°F) I’ve already mentioned. Check the packaging for details if you’re unsure.